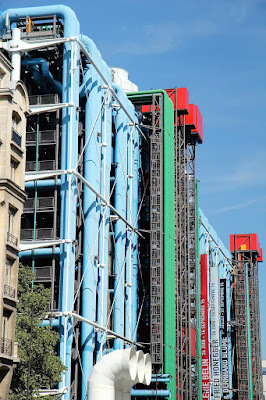 The Pompidou Center is a large building in Paris that houses several different cultural organizations, including the National Museum of Modern Art. 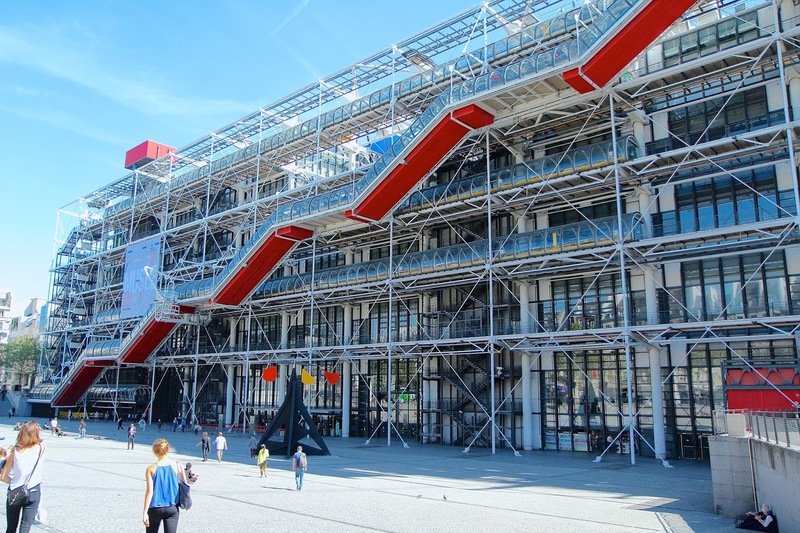 Since the art museum dominates the center, and since it receives masses of visitors, it is generally known as the Pompidou Center. 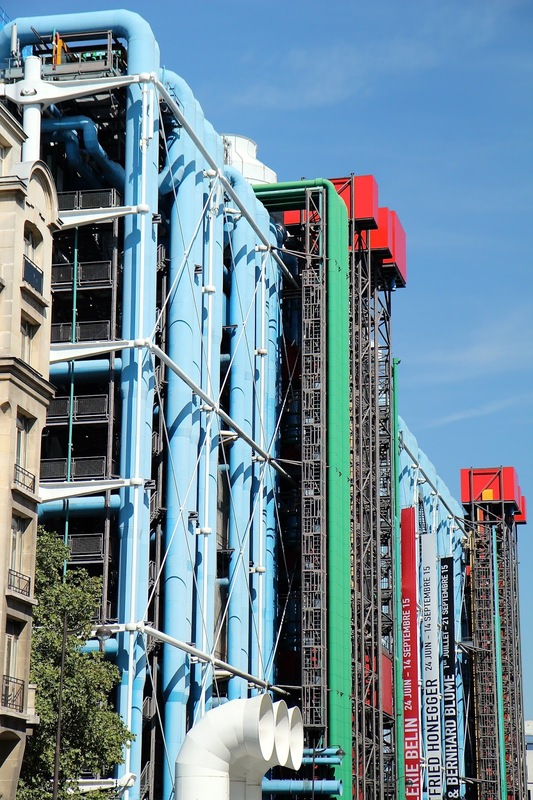 Pompidou Center opened in 1977, and its high-tech architecture stunned the world. The Pompidou has a very impressive collection of art of the 20th century. It was a huge breakthrough to think of a painting as a thing-in-itself, instead of an imitation of the real world. It liberated artists to go every which way, and they did. Matisse is generally credited with starting Fauvism in 1904. 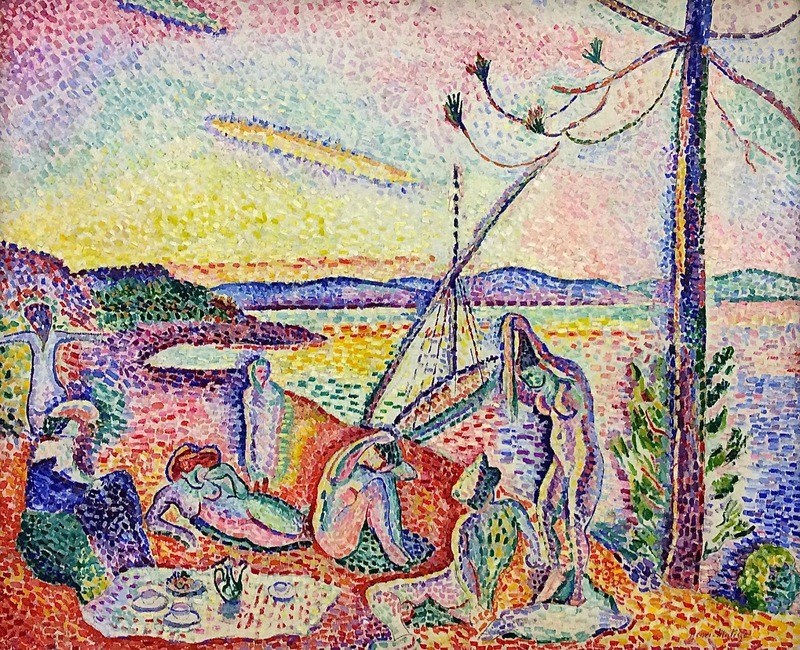 Fauve in French is usually translated as 'wild beast.' 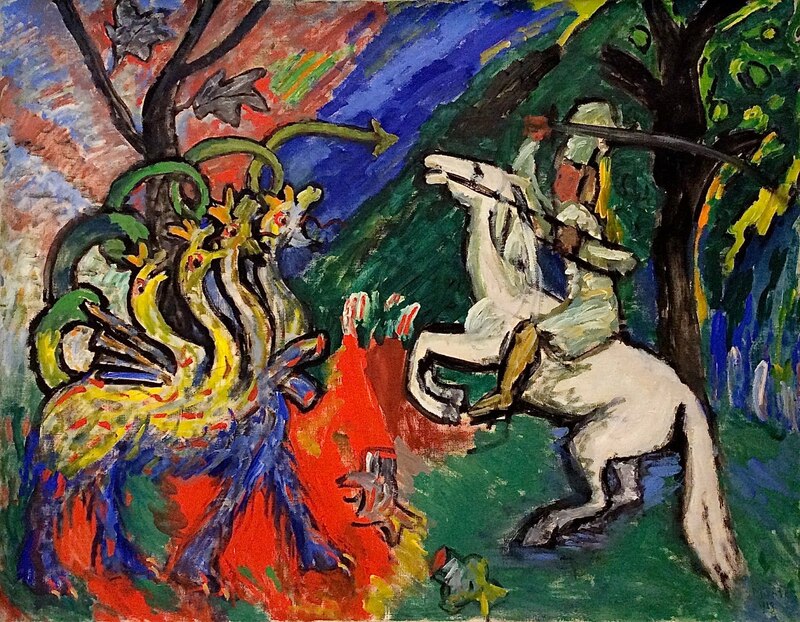 Painters who worked in this style were called 'wild beasts' because they moved painting such a great distance from the imitation of the real, which had been the tradition of centuries. 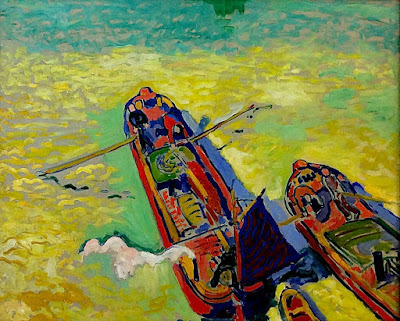 Fauvists used vivid, non-naturalistic colors. Plus, they schematized forms, distorted perspective, and left their brushstrokes clearly visible. 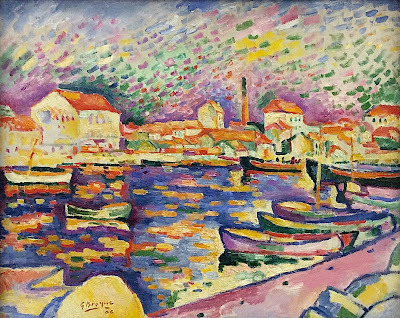 Fauvism lasted only a few years as an identifiable movement, but the idea that color could be divorced from reality and still have meaning had long-term influence. 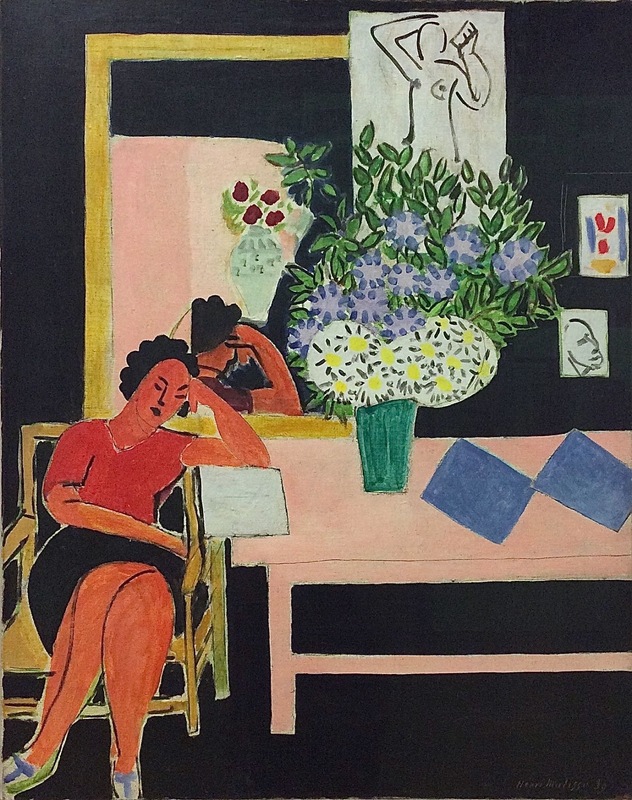 Matisse soon moved on from Fauvism, but color continued to be a dominant force in his painting. Most of Matisse's work is figurative, but he is not interested in anatomy. His human forms are basically design elements. 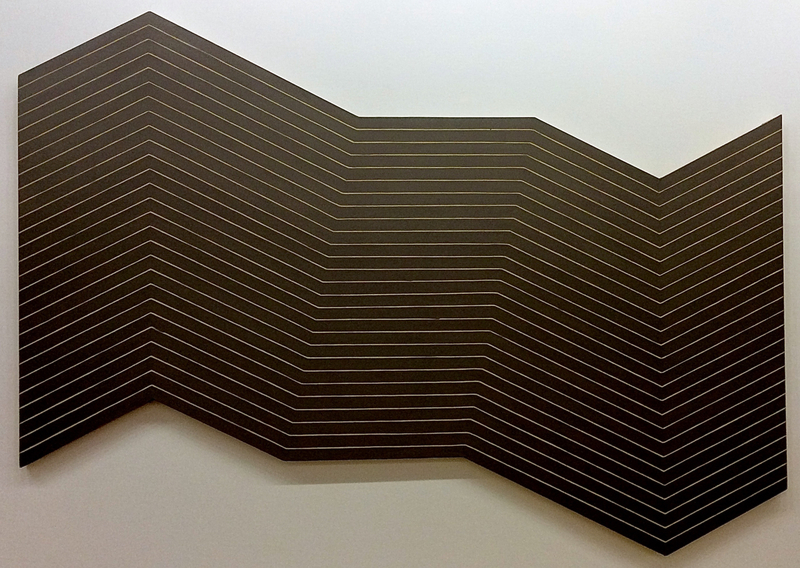 His work became increasingly flat and design-oriented. 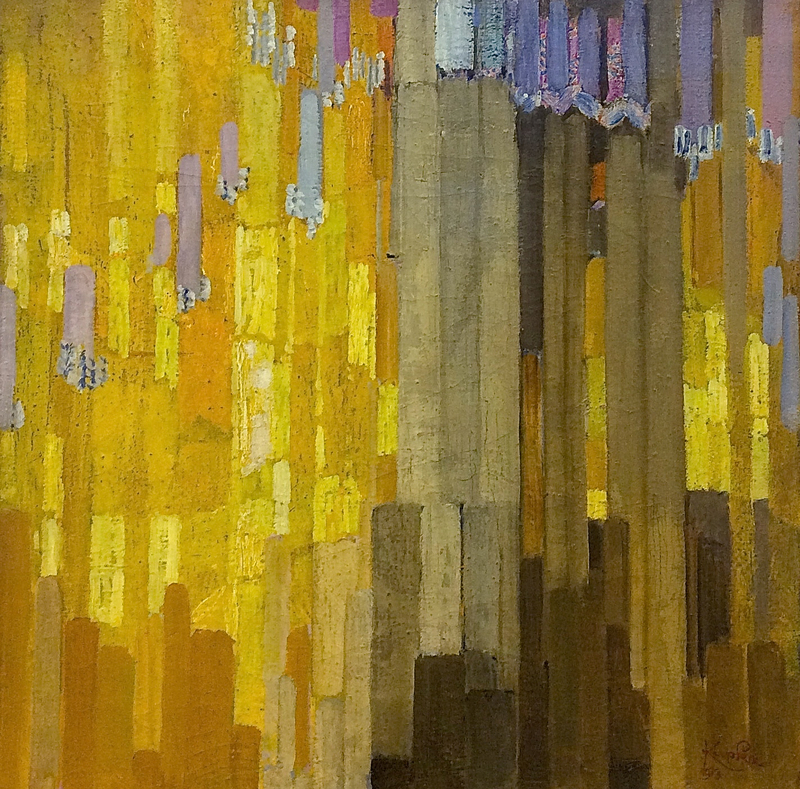 Kupka was born in Bohemia, part of the Slavic region of Europe. After studying in Prague and Vienna, he settled in Paris in 1896. 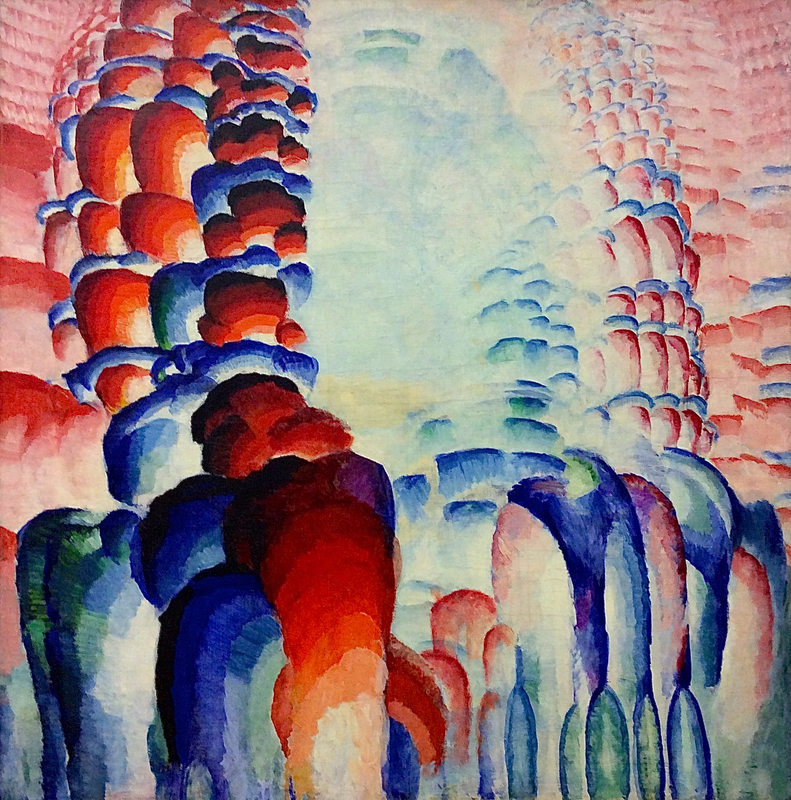 Kupka was a co-founder, with Robert and Sonia Delaunay, of an art movement known as Orphism around 1912. Orphism is an offshoot of Cubism that turned into lyrical abstraction, relying solely on form and color to communicate meaning. 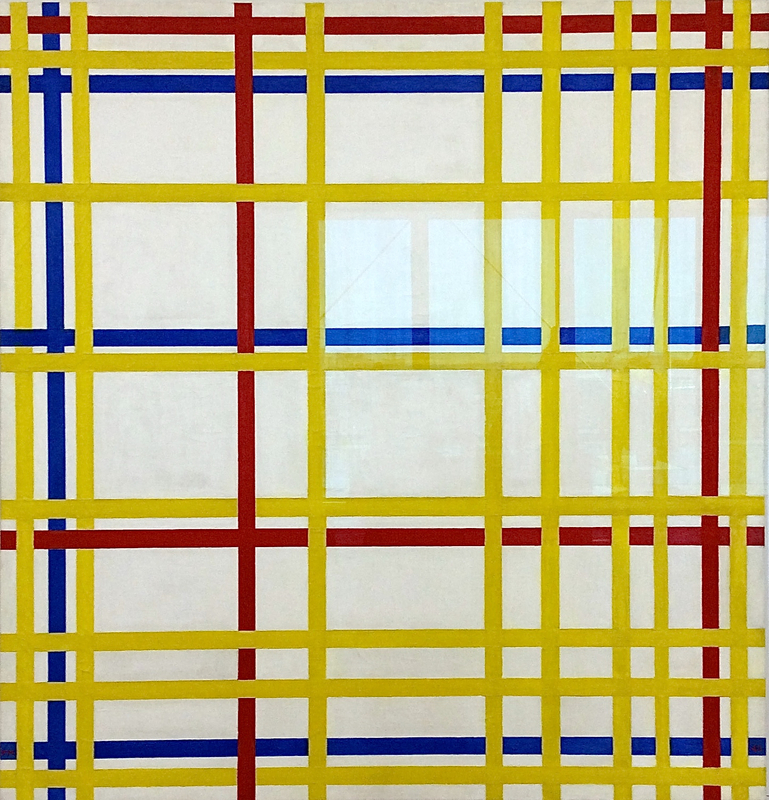 Mondrian created the geometric approach to abstraction in painting. 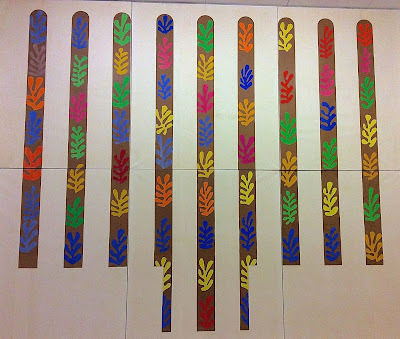 He limited himself to straight horizontal and vertical lines. His approach to color was also restrictive. He allowed himself only pure yellow, pure red, and dark blue, and black on a white ground. His approach was enormously popular. His designs, if not his name, were known by the general public through their commercial application. 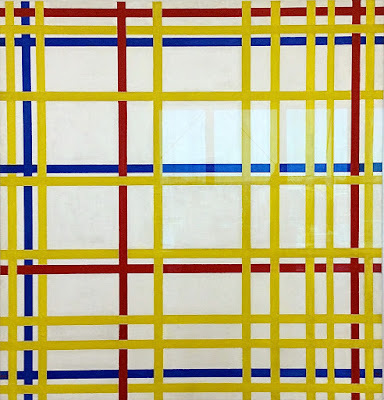 Few artists could maintain his restrictions or his detachment for long, but many were liberated by his example to develop their own form of geometric abstraction. Münter was one of the originators of the Expressionism in painting, a style that was especially popular among German artists. Expressionist paintings had regular subject matter, but images were distorted in order to evoke moods or ideas. Painters used rough or simplified forms, applied color freely, and exaggerated their brushwork. Expressionism is a broad, general category including many different approaches. Paul Klee's paintings show the influence of various 20th century styles, while not fitting any category. 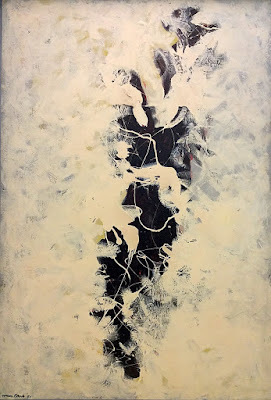 His work is almost always abstract, but it usually has some reference to subject matter. 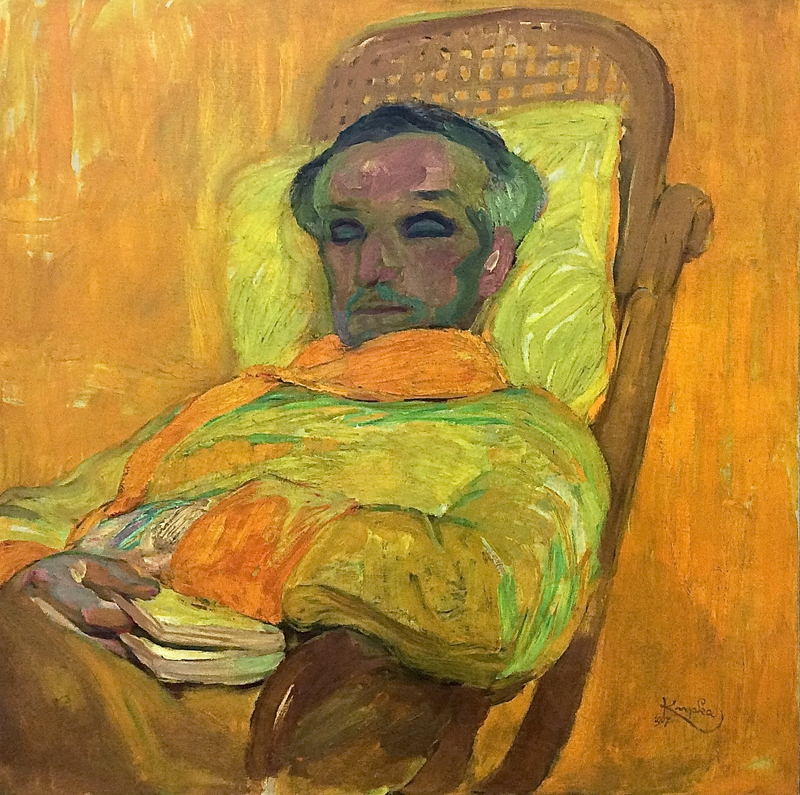 His colors are not tied to reality, but they are usually modest and subdued. 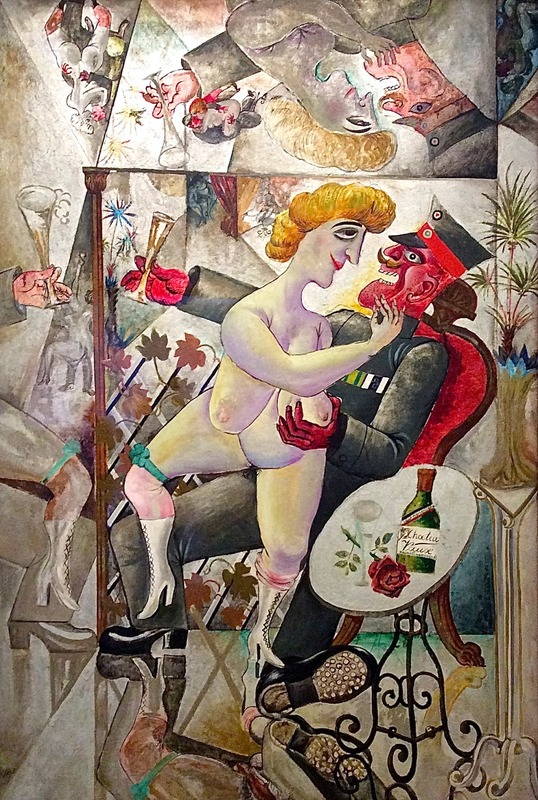 Sometimes his work has a dream-like quality that connects it to Surrealism; often, it is dominated by pattern. 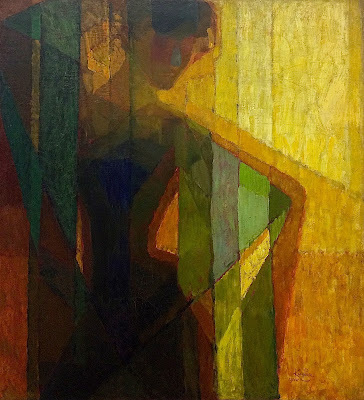 Around 1911, his work began to show the influence of the Old Masters, using classical drawing and austere colors. He became one of the leaders of the Classicism movement. 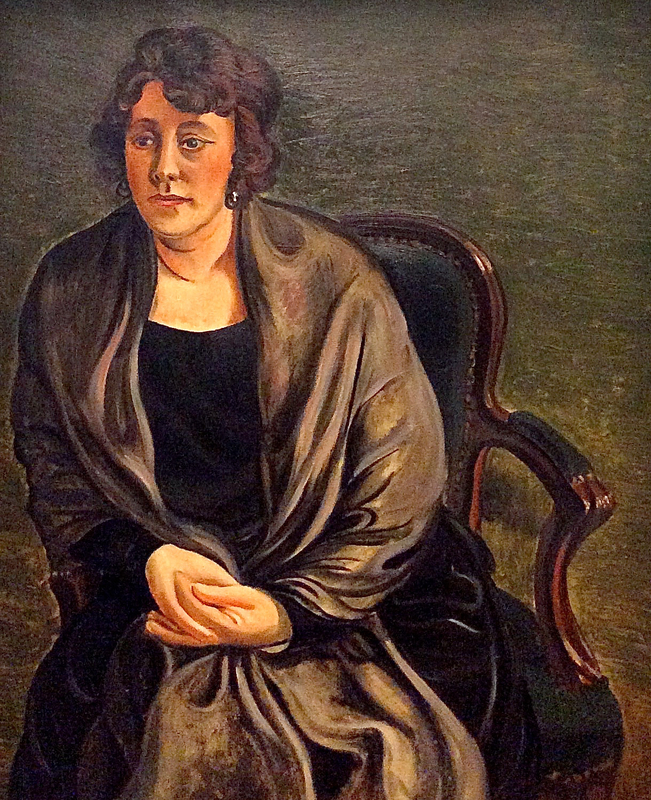 Lucie was the wife of André's dealer. 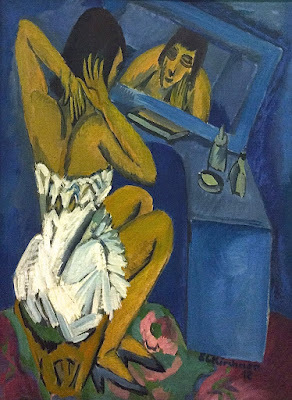 Kirchner was one of the leaders of German expressionism. He is famous for depicting street life and night life. 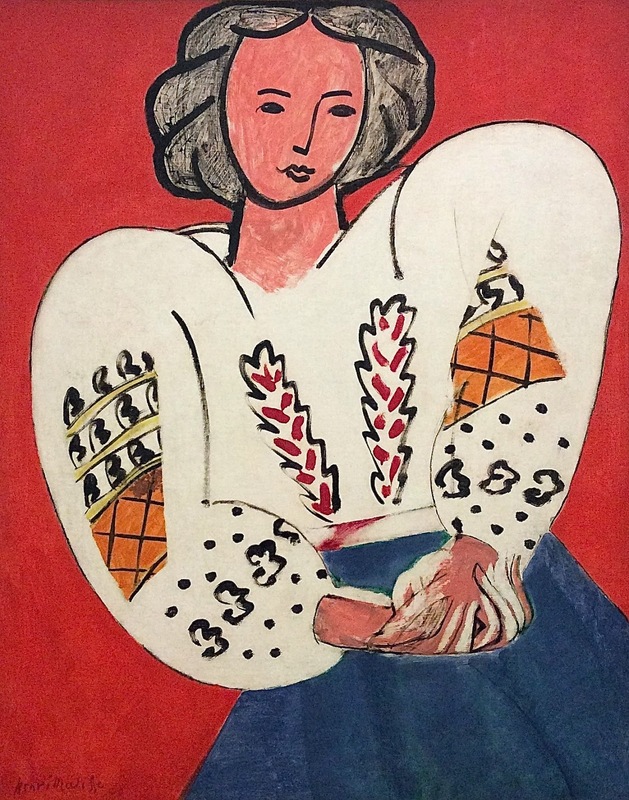 Picasso and Matisse were the twin stars of Modernism. While Matisse and Derain were developing Fauvism—which manipulated colors for expressive reasons—Picasso and an artist named George Braque were inventing Cubism—which manipulated shapes and forms to create meaning. Matisse soon abandoned Fauvism, but the succession of personal styles that followed were all dominated by expressive use of color. 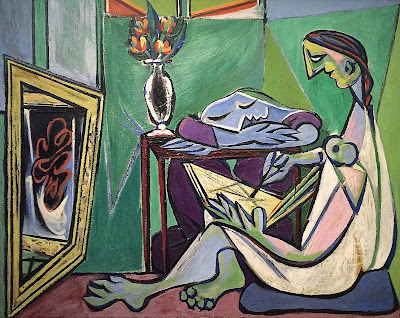 Picasso experimented with many versions of Cubism before he moved on, but most of the styles that followed retained expressive distortion of shapes. 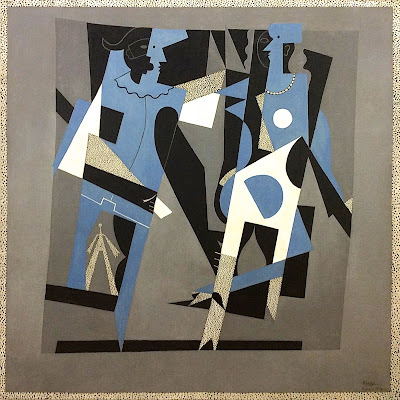 Around 1907, Picasso and Braque began to focus on the shapes in images, to analyze the underlying geometry, to deconstruct images into shapes, and to recombine those shapes to form an abstract pattern. This movement is called Analytical Cubism. The Pompidou did not have an example of Picasso's work with Analytical Cubism, but they did have some examples by Georges Braque. After their analytical investigations, Picasso and Braque realized that they could also synthesize images by combining shapes of their own invention. The resulting paintings generally look like collages made of pre-cut paper shapes. 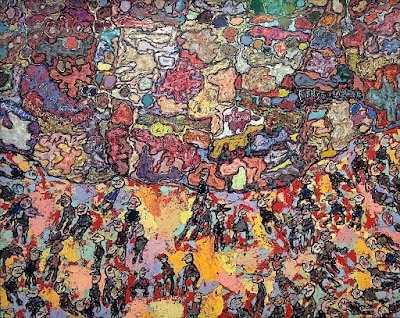 And, in fact, this is the way collage was invented, because the artists would throw in bits of real paper—such as newspaper or wallpaper—or they would paint images that looked like bits of real paper. 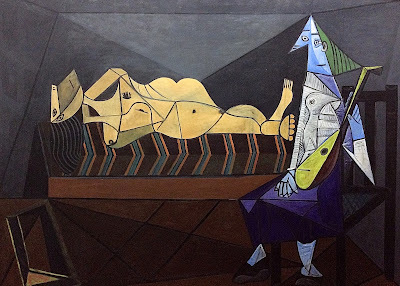 The museum had a couple of fun examples of synthetic cubism by Picasso. 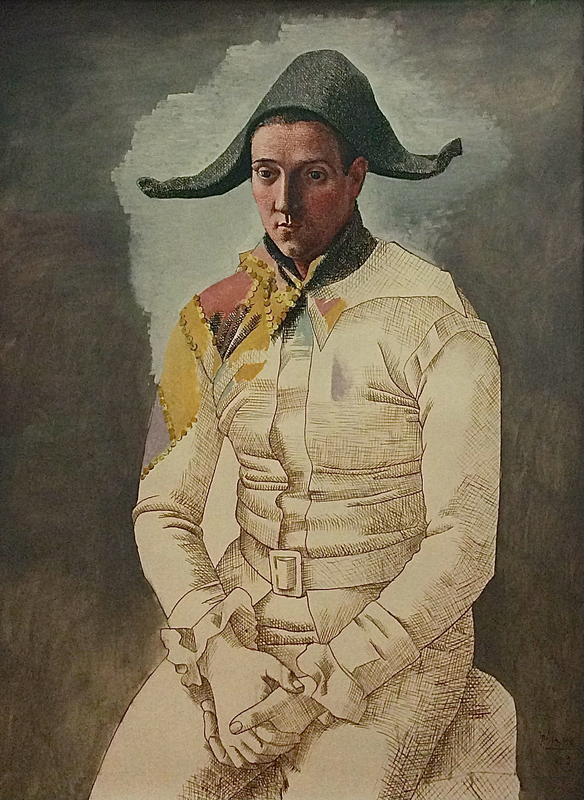 After a long period of experimentation, Picasso turned his attention to the Old Masters and became part of the Classicist movement. It looks as though he wanted to refresh his draftmanship, which was formidable. After Classicism, Picasso pursued a number of styles that depended on the expressive manipulation of form. 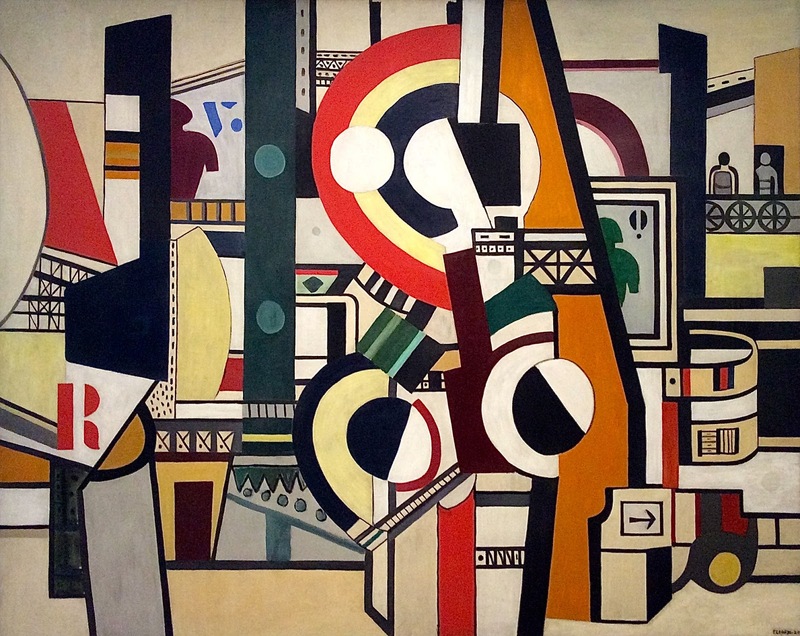 Léger got involved with Cubism around 1911, and over the course of his career he developed a number of unique variations. His personal addition was to analyze images into cylindrical shapes, like cones and tubes. Goncharova was one of the few women artists exhibited at the Pompidou. In the early 1900s, she was part of a very innovative group of painters in Russia. She pursued a number of styles, ranging from Neo-Primitivism to Futurism. 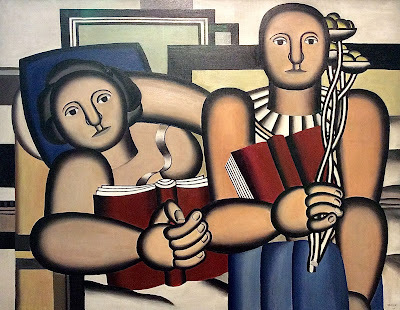 With Neo-Primitivism she attempted to create a style that fused the crude drawing of peasants with Modernism through the simplification of forms and colors and the rejection of perspective. 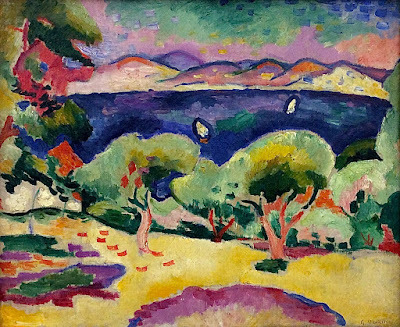 Braque was extremely important to the development of both Fauvism and Cubism. 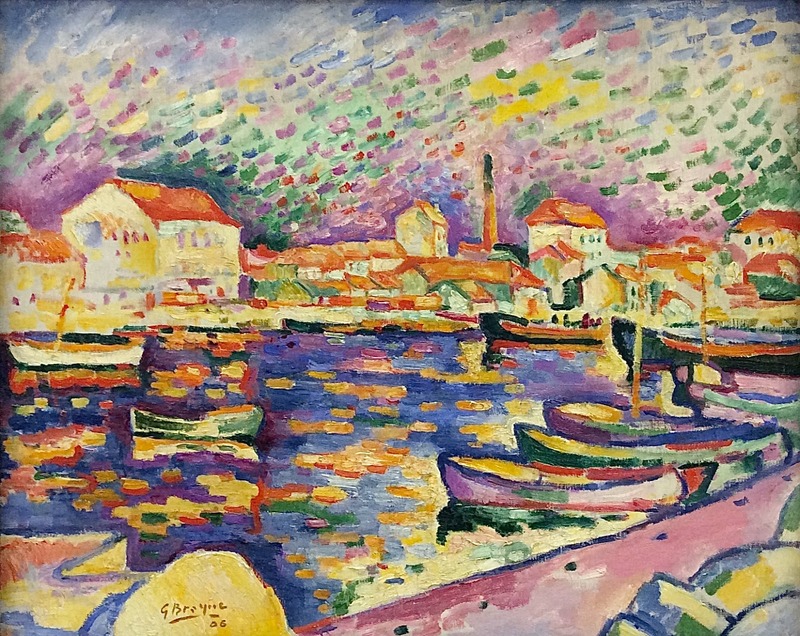 Although Braque was not involved with the original Fauvism, he soon adopted the style and made many paintings with wild and wonderful color schemes. 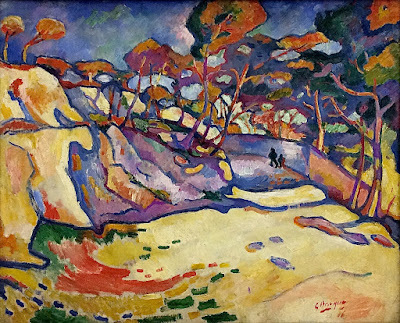 After a few years of Fauvism, Braque began to focus more on form than color. 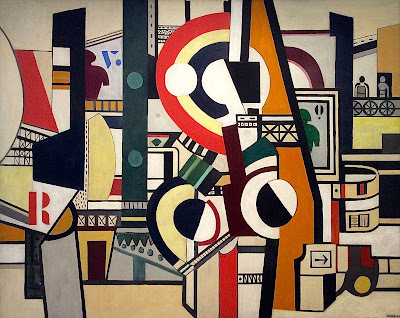 He started by reducing the architectural structures in a scene to geometric forms. Beginning in 1909, Braque began to work closely with Picasso in the development of Cubism. 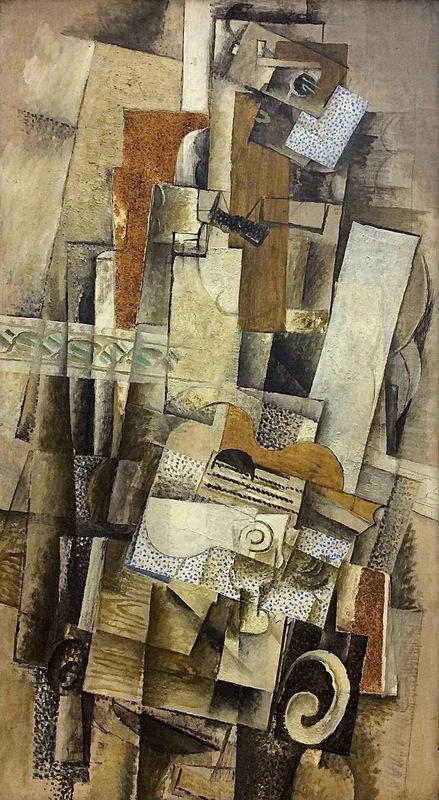 They fractured a scene into cubic forms, so this style is called Analytical Cubism. 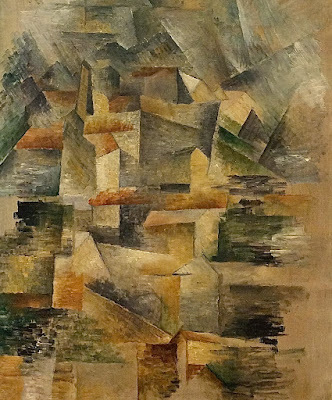 After a period of analyzing images into their component parts, Braque and Picasso began to turn the process around and fabricate new images by piling up geometric forms. This style is known as Synthetic Cubism. 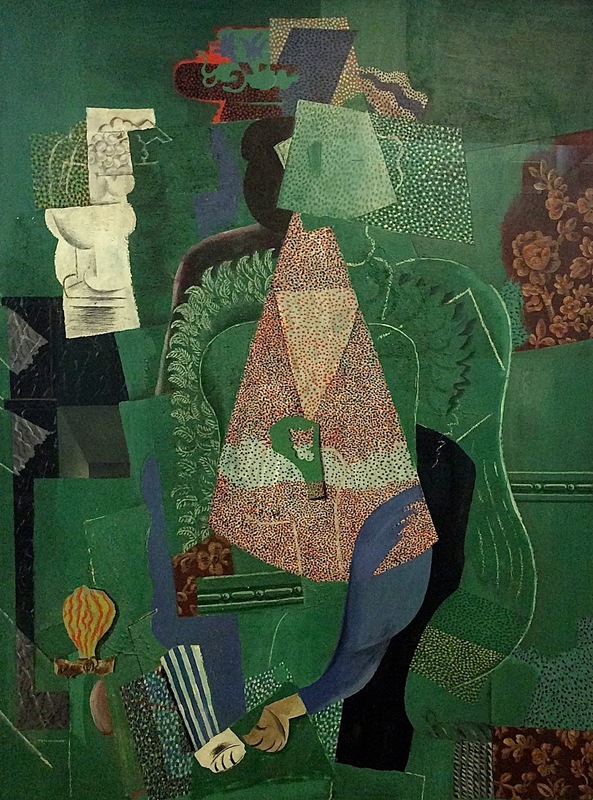 Sometimes Braque actually used shapes cut from printed materials, such as wallpaper; this is the foundation of collage as an art form. Sometimes he painted an illusion of a collage. Although Marie Laurencin eventually became an important designer in the world of Paris high fashion, her fame was originally based on her relationship with Picasso and his circle, including the poet Apollinaire. Two expressive paintings of this group insured her claim to a place in art history. 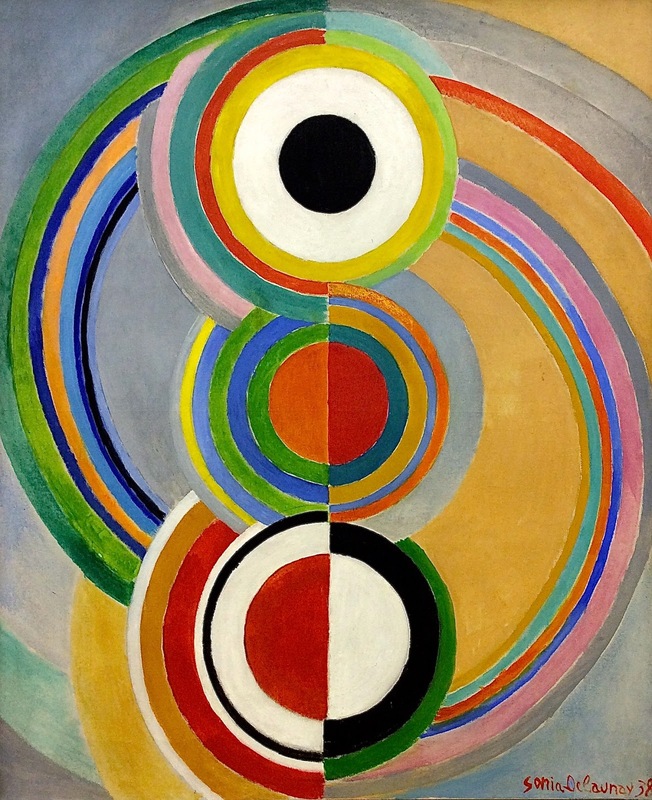 Like many artists, Sonia Delaunay started her career as a Fauvist, communicating a mood through daring use of color. 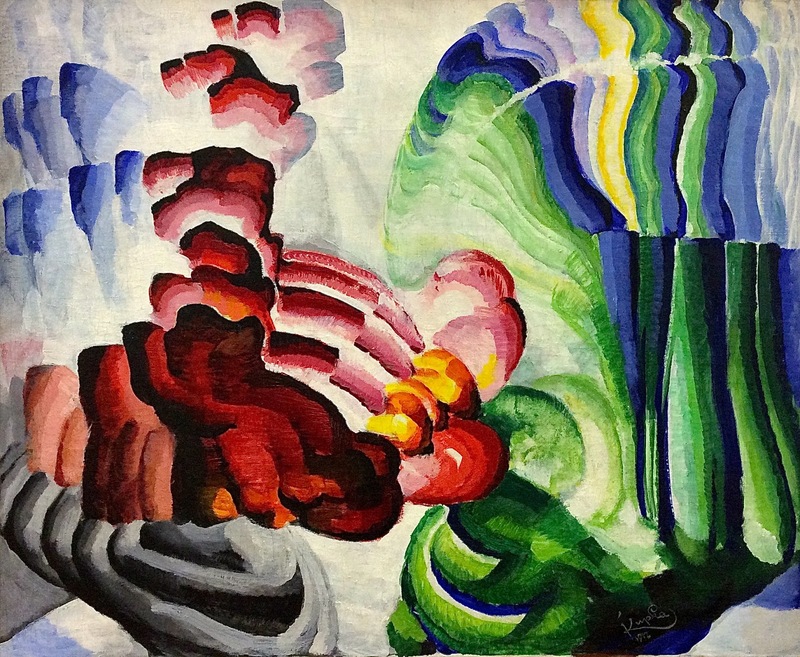 Later in her career, Sonia was one of the founders of Orphism, a variation of Cubism in which color dominated abstract shapes. 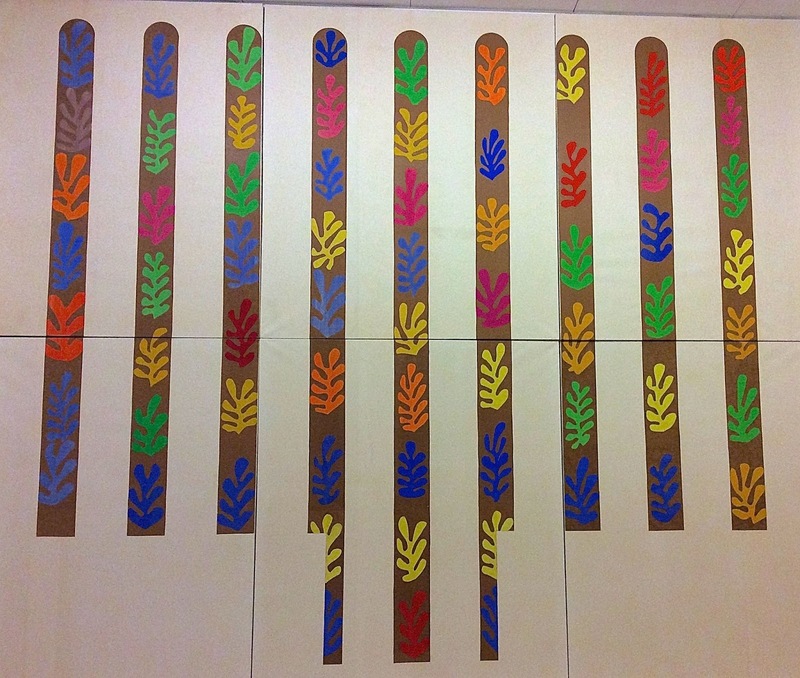 Still later, Sonia did some completely abstract designs featuring bold colors and limited shapes, like the following. 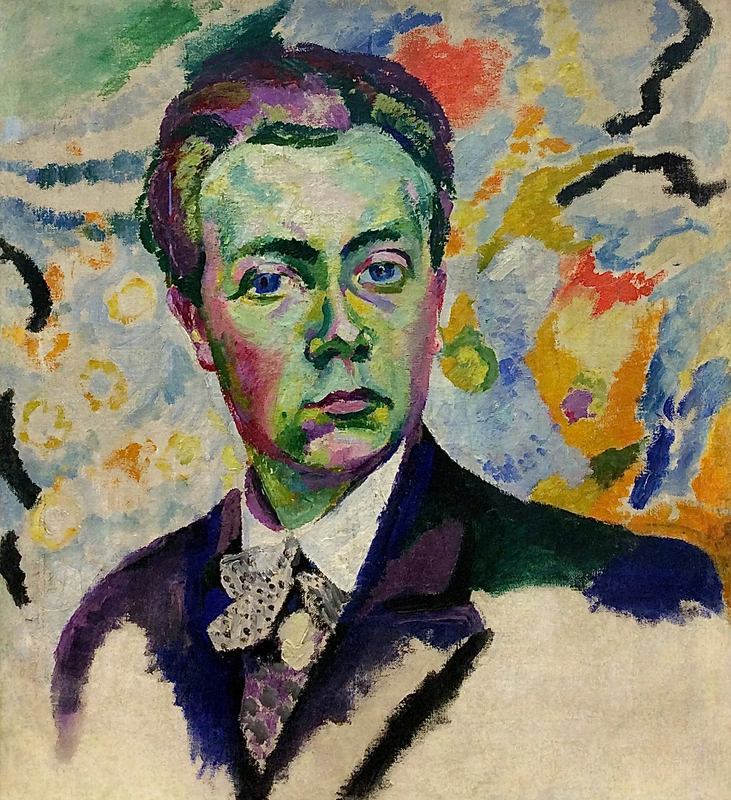 Robert Delaunay was painting under the influence of Post-Impressionism and Fauvism in 1906. 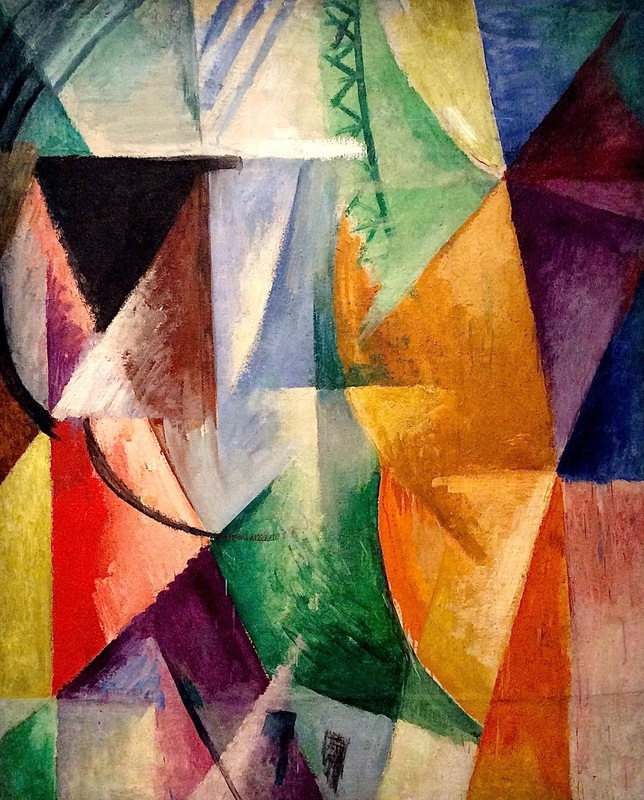 By 1912 Delaunay was beginning to analyze shapes in the Cubist manner. 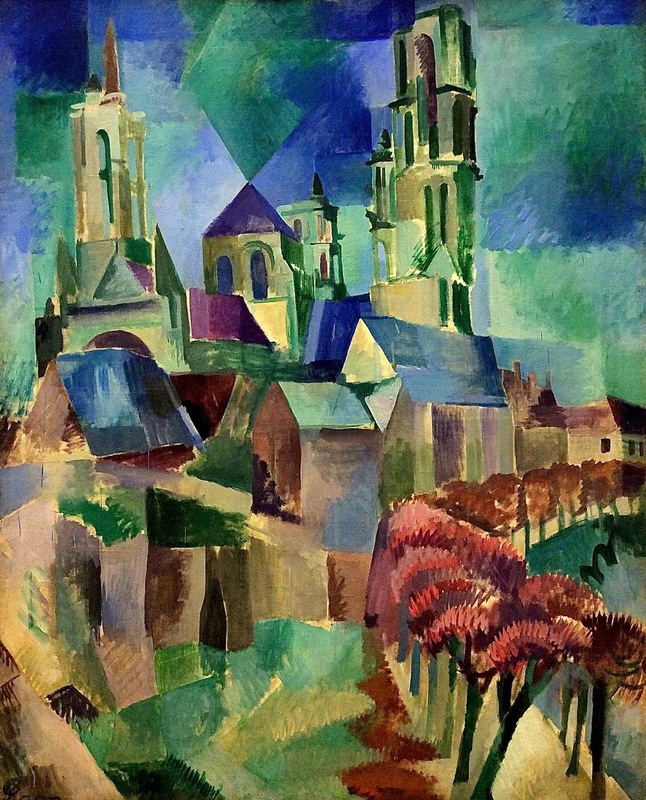 He was one of the founders of an offshoot of Cubism known as Orphism which emphasized color. Delaunay drove Cubism in a very abstract direction for a long period. Later his paintings returned to objective subject matter, but his depiction of forms in space continued to be distorted. Still later, Delaunay did some completely abstract designs, with the purpose of expressing aspects of music. 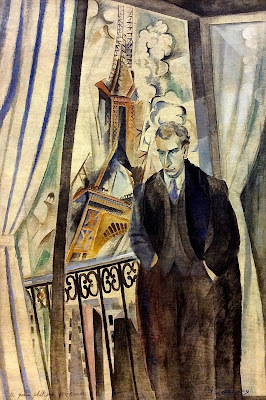 Chagall was frankly concerned with his own feelings and memories. Because he was depicting his inner world, most of his paintings have a dreamlike quality. One of his favorite subjects was his love for his wife. 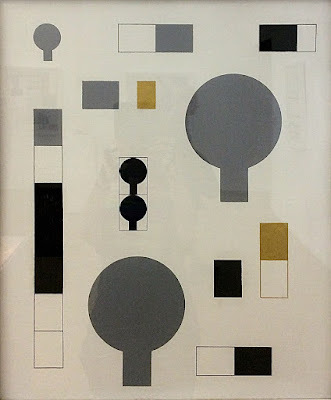 Sophie Taeuber-Arp was a multi-talented artist who specialized in textile design. 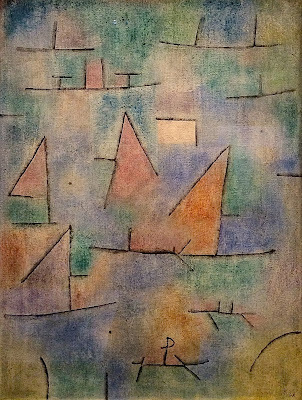 Sophie's most well-known works are geometric abstractions. However, they are totally irregular because they are influenced by a school of art known as Dada, which promoted nonsense over logic. 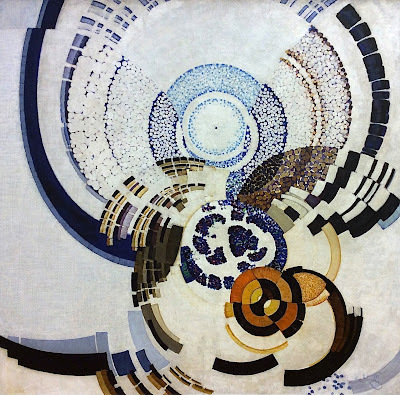 In the 1920s, after 20 years of experimentation, many artists turned their gaze back on the real world and formed a movement that became known as the New Objectivity. 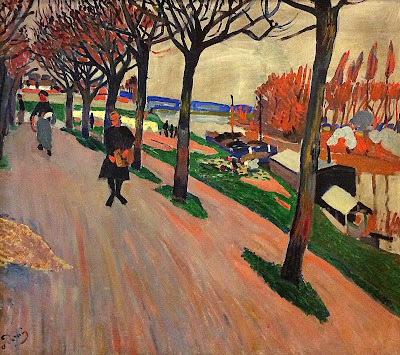 This movement was especially strong in Germany, where the artists had become jaded and disillusioned. 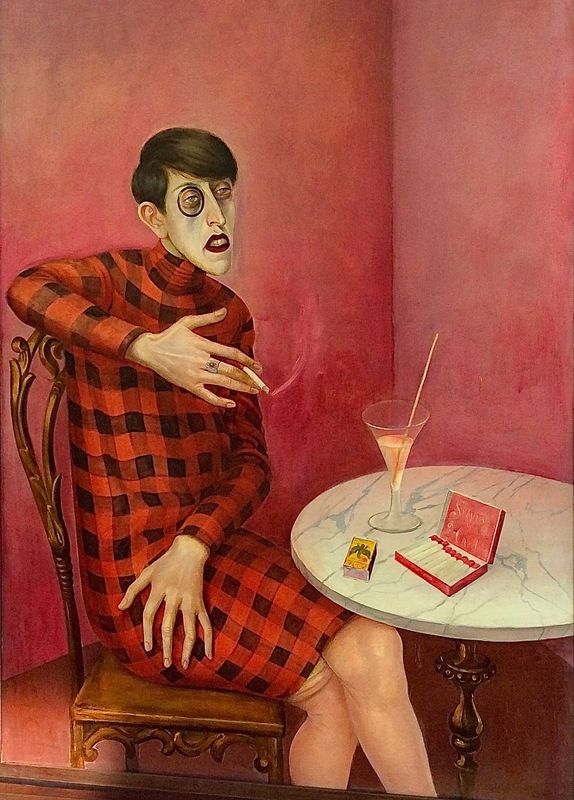 One of its major proponents was Otto Dix. Magritte was a Belgian painter who worked in Paris for a few years, where he became a leading member of the Surrealism movement. 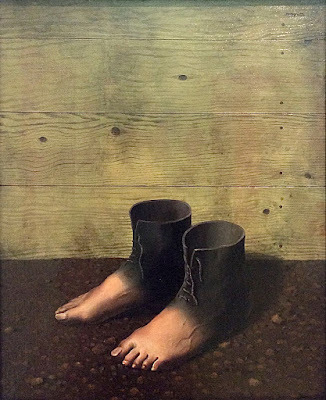 Surrealism was a style that used the techniques of realism to depict situations which couldn't exist in real life. Magritte's particular approach to Surrealism involves optical tricks and intellectual puzzles. Dubuffet was a maverick artist who promoted values that were generally rejected, such as madness, crudity, and chaos. 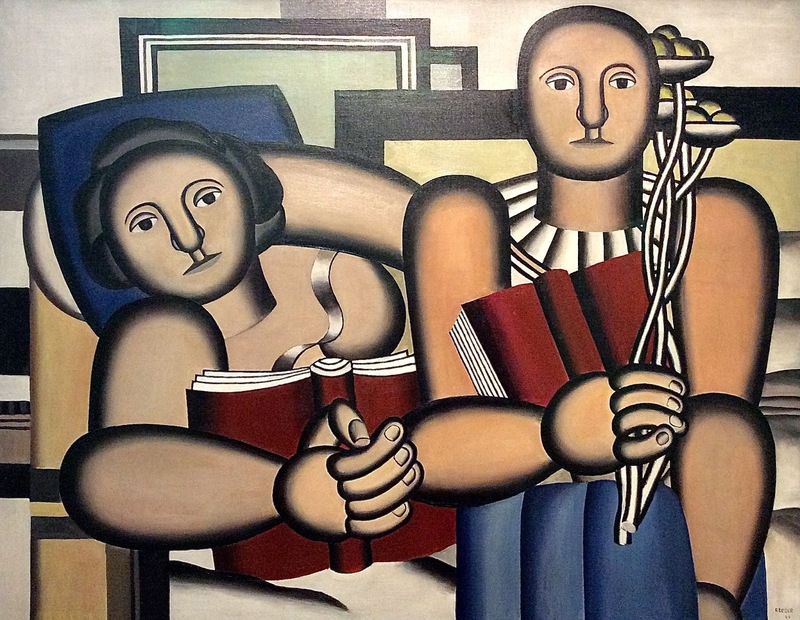 After World War II, when the economy of Europe was decimated and that of the U.S. was flourishing, New York City became the center of the art world, rather than Paris, as it had been for a couple of centuries. 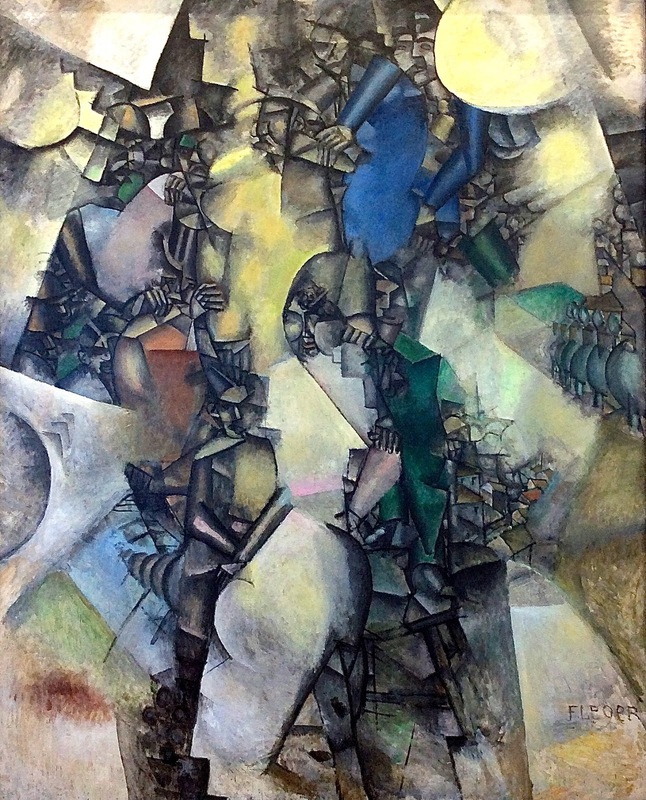 This is reflected in the collection of the Pompidou by the inclusion of works by a few American artists. 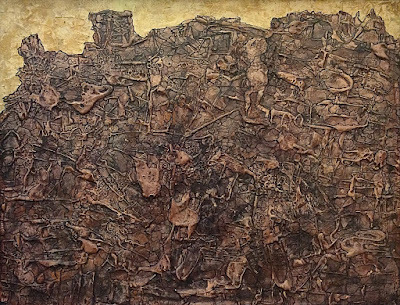 In New York, the dominant painting style of the post-war period was known as Abstract Expressionism. 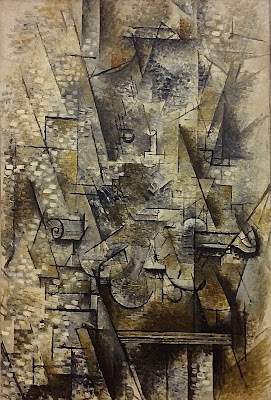 This was a liberated type of abstraction, not tied to geometry or objective forms. Artists searched for new and expressive ways to apply paint to canvas. Jackson Pollock was one of the most famous Abstract Expressionists. He is especially known for flinging paint on canvas in a systematic manner. 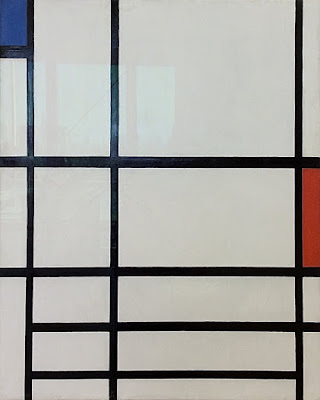 Another group of American artists pushed Abstraction in the opposite direction, back toward the rigid geometry and simplified color of Mondrian. These artists were interested in pushing minimal elements to create the maximum effect, so their style is known as Minimalism. Joan Mitchell was an American who followed in the footsteps of Jackson Pollock in using novel and energetic ways to apply paint to canvas. 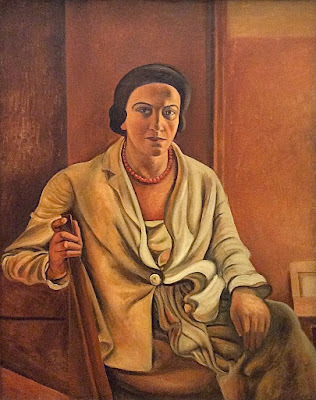 She is one of the few women painters to be shown at the Pompidou, and she is one of the most famous woman painters of the century. 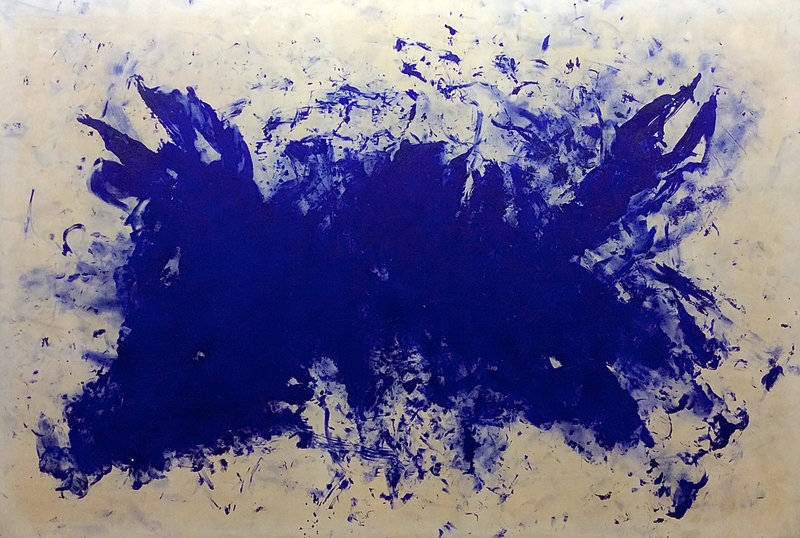 Yves Klein dominated French art for a period in the 1950s. He was a prankster and an iconoclast. His innovative work challenged aesthetic principles. 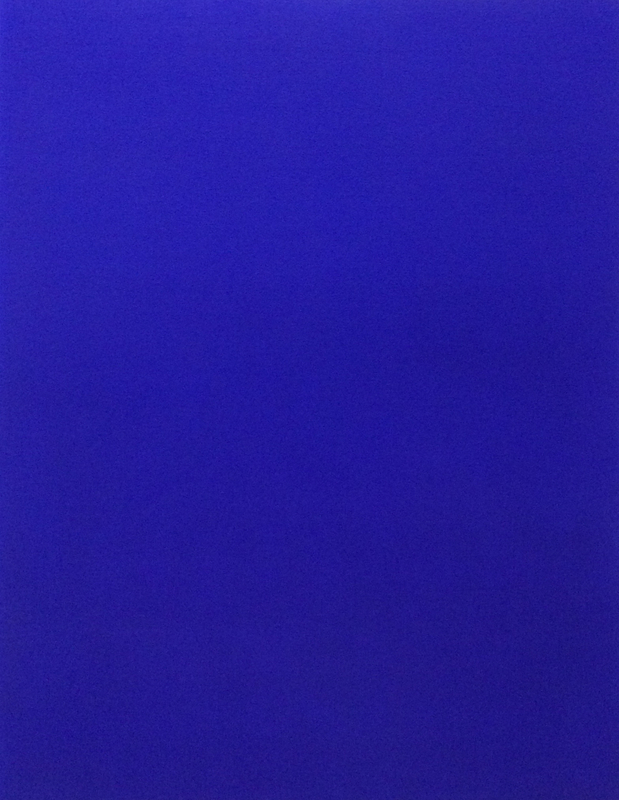 He is especially known for the "invention" of a personal shade of blue—known as "YKB" for Yves Klein Blue—which he might apply to anything. Stella is a living American painter who first came to fame in the 1960s. 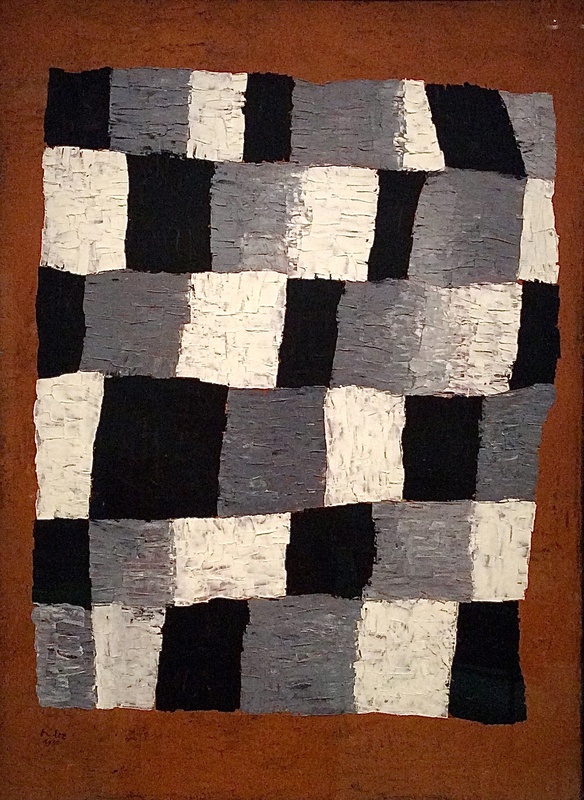 At that time, he was working in a generally Minimalist style, while innovating the shaped canvas. 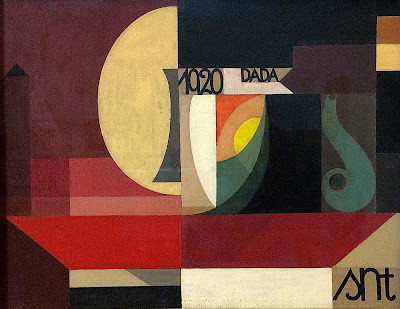 In the 20th century the goal of depicting the real world was almost completely abandoned, in favor of technical experimentation, personal expression, and the exploration of aesthetic principles. 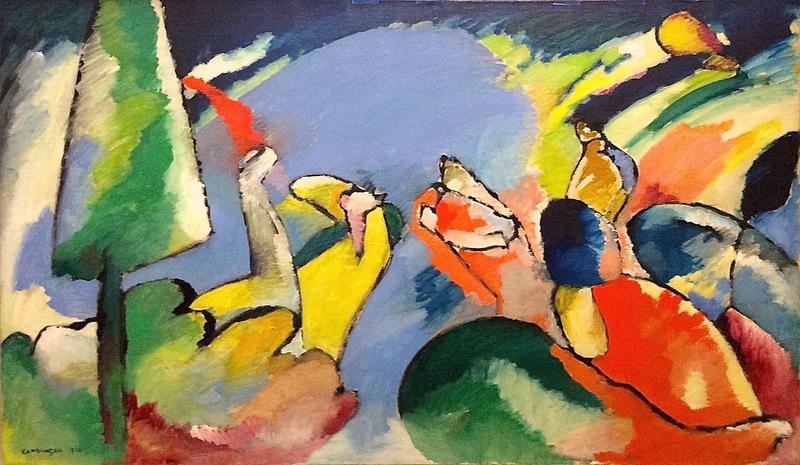 This led to a proliferation of stylistic movements: Fauvism, Cubism, Expressionism, Surrealism, Classicism, Abstraction, Minimalism, and what we might call a 'maverick' style that questions established art values. Artists are known by their styles, but this can be tricky because several artists progressed from one style to another, and artists freely mixed styles to fit suit their needs. 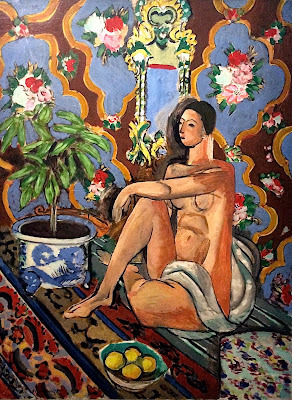 The twin stars of the first half of the century were Picasso and Matisse. Picasso is generally known as a Cubist, and most of his styles are dominated by the distortion or manipulation of forms. 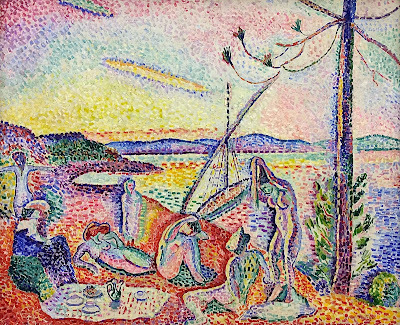 Matisse was one of the originators of Fauvism, and all of his succeeding work was dominated by expressive use of color. Braque contributed to the development of both Fauvism and Cubism. 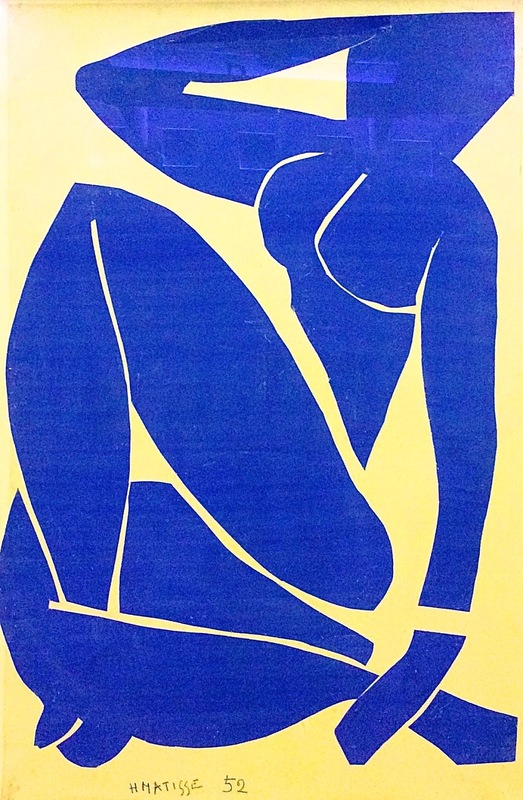 Léger developed Cubism in many directions, but he tended to emphasize circular and tubular forms. Sonia Delaunay, Robert Delaunay, and Frantisek Kupka developed a coloristic approach to Cubism known as Orphism. 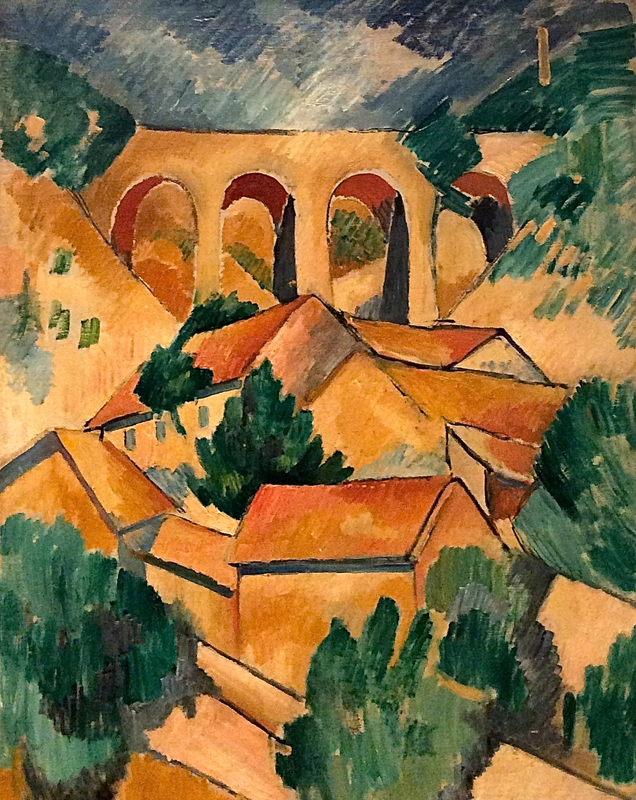 André Derain made important contributions to Fauvism, and went on to a long Classical period. 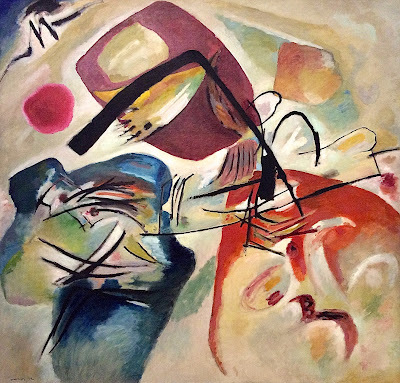 Abstraction was brought to art by Kandinsky, one of the greatest abstractionists of the century. 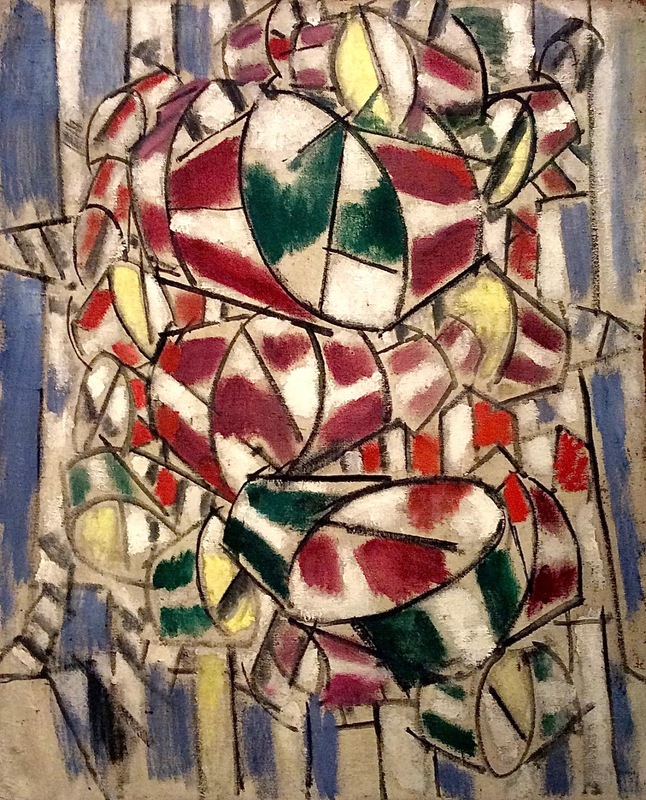 Piet Mondrian practiced a rigid, geometric abstractionism, using limited forms and colors. 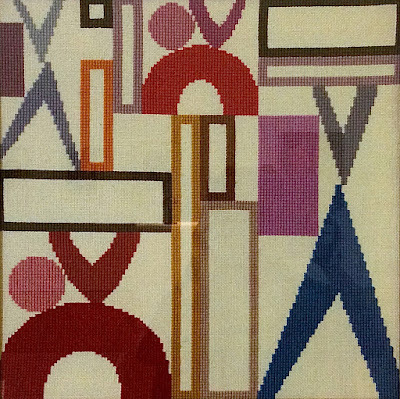 Sophie Taeuber-Arp applied geometric abstractionism to the creation of textiles. 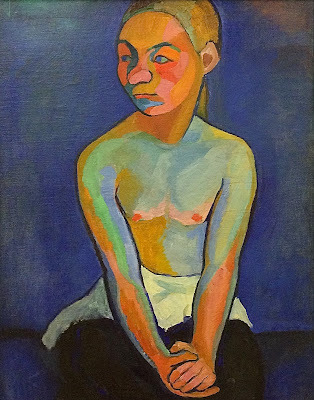 Gabriele Münter and Ernst Kirchner were leaders in the development of German Expressionism, which is characterized by expressive brushwork. 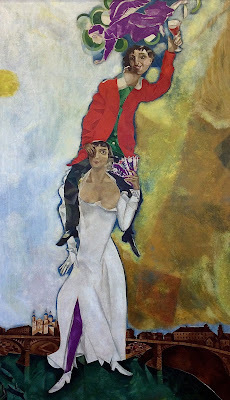 Marc Chagall was an Expressionist whose paintings depicted feelings and memories. 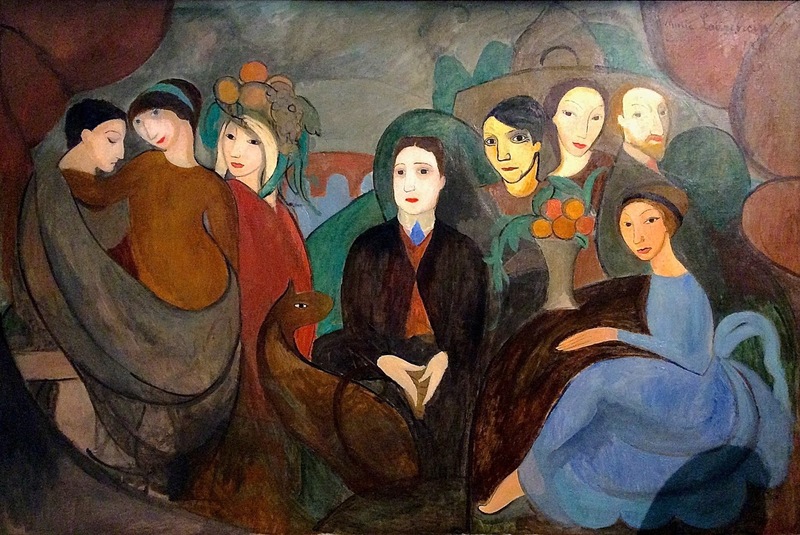 Marie Laurencin was an Expressionist whose work relied on graceful forms. 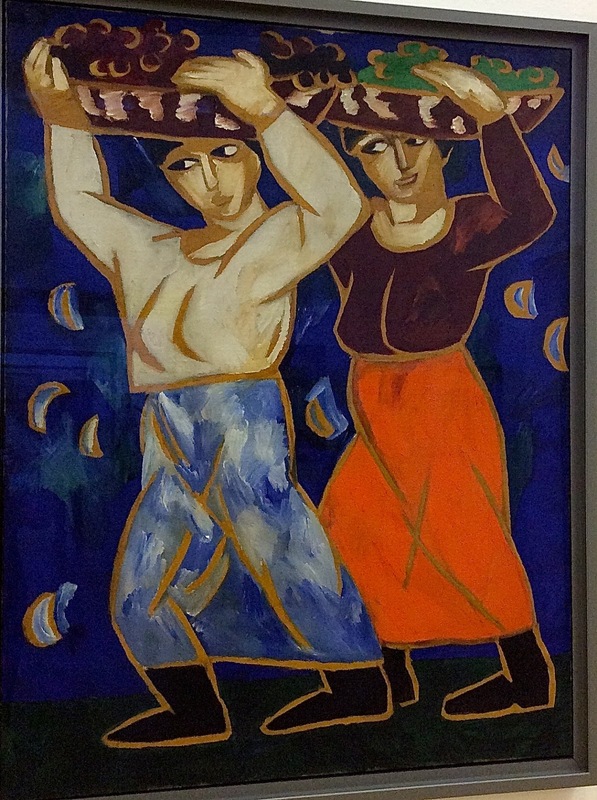 Natalia Goncharova started her career as a Primitivist, in the first few years of the century. 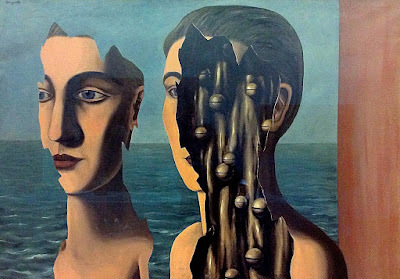 Magritte was one of the originators of Surrealism; his images were intellectual puzzles. The main goal of certain artists was to break the rules. These could be call maverick artists or pranksters. 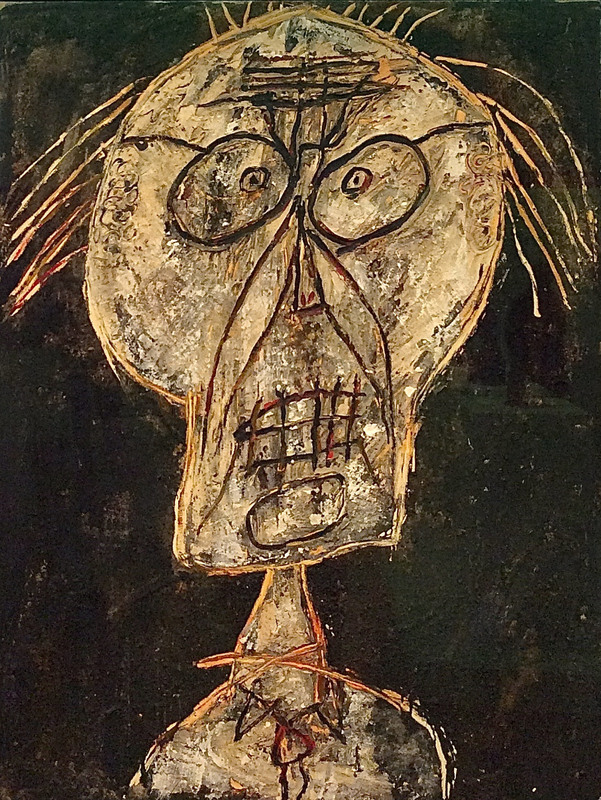 Jean Dubuffet was a maverick who imitated the primitive styles of crazy people. 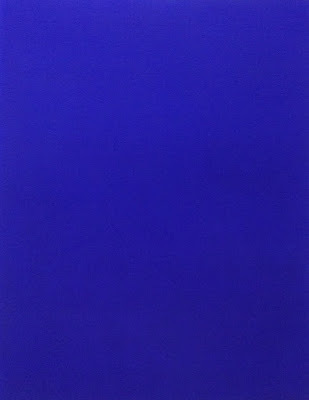 Yves Klein was a maverick who favored his own shade of blue. Otto Dix was one of the major proponents of the New Objectivity, which was concerned with portraying modern life. Jackson Pollock was one of the first important Abstract Expressionists, who is known for dripping and flinging paint onto canvas. 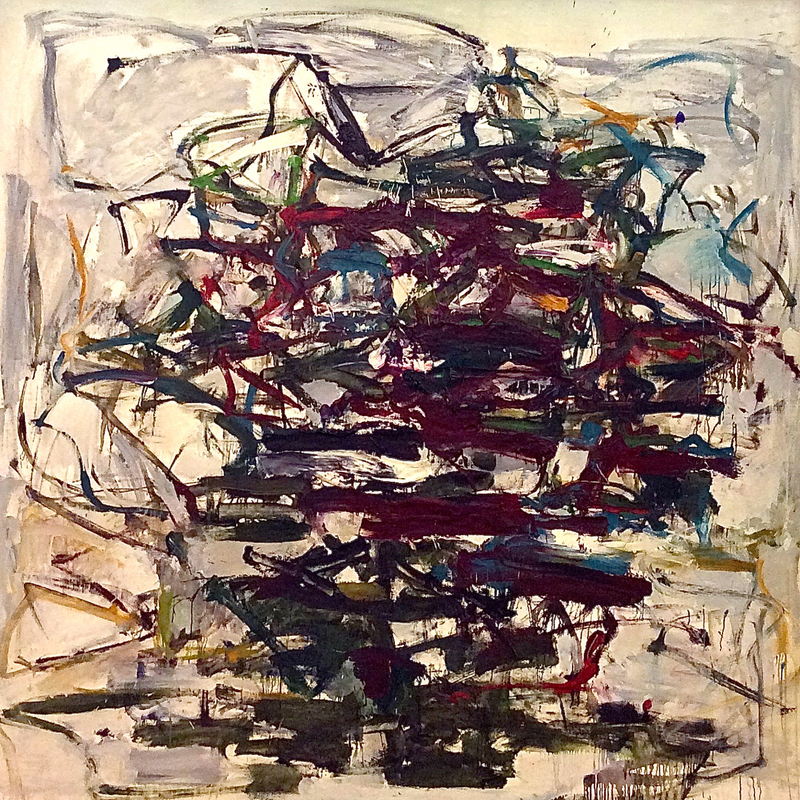 Joan Mitchell led the next generation of Abstract Expressionists with her highly energetic brushstrokes. Ellsworth Kelley and Frank Stella were minimalists, simplifying the elements of art to a bare minimum.